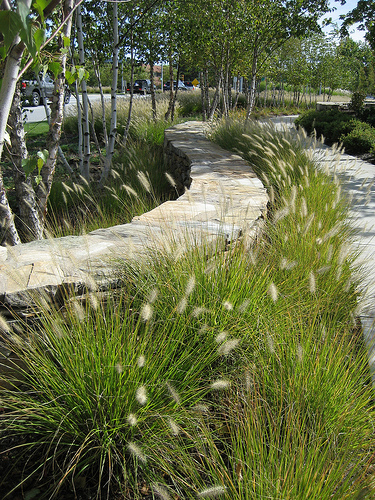 The landscape of the Natick Collection is designed to give a clear identity to this retail district and to provide a rich and varied experience for pedestrians. The plantings soften the experience and transform the vehicular routes into a public space with strong visual connections to the community and the outlying roads. A series of low stone walls reminiscent of the New England countryside highlights the main entrance. The walls provide a datum that remains at a constant height, highlighting the rolling grades of the ground plane. Lighting fixtures embedded within the stone walls, illuminate the sinuous forms of the walls at night.